I want you to think about the school year during summer? Yes I do. Just hear me out for a minute. Don’t worry, I still want you to enjoy your summer. Summer is a time I always look forward to. Two months off to relax, regroup, travel and even do a little planning. Did June fly by for you too? However, just taking a little time now to reflect on what worked for you last year will help you continue that trend. Did some new therapy materials get amazing results? Or did you find a new organization tool? You want to keep that good stuff going. Take a moment right now. Close your eyes and think about going back to work. What’s the first thing you think of that fills you with dread? Or that gives you that “oh yuck” feeling? You know, that activity that you wish you could pay someone to do for you? Really, I’m not trying to bring you down. I’m suggesting you take a look at what you can do to make it better. Hands down lack of time and too much paperwork were the biggest obstacles. I know it can be overwhelming at times. So what I’m suggesting is that you take a little bit of your down time, even if you’re just making some mental notes from your beach blanket, to put some systems into place that will make the coming school year run more smoothly. During the next few weeks, we will explore some systems and thought processes that will help you free up your time. So you can get your school year running smoothly and spend more time doing what is really important to you…spending time with your students and making a difference in their lives. We’ll explore it all from IEP’s to scheduing to progress reports to billing. 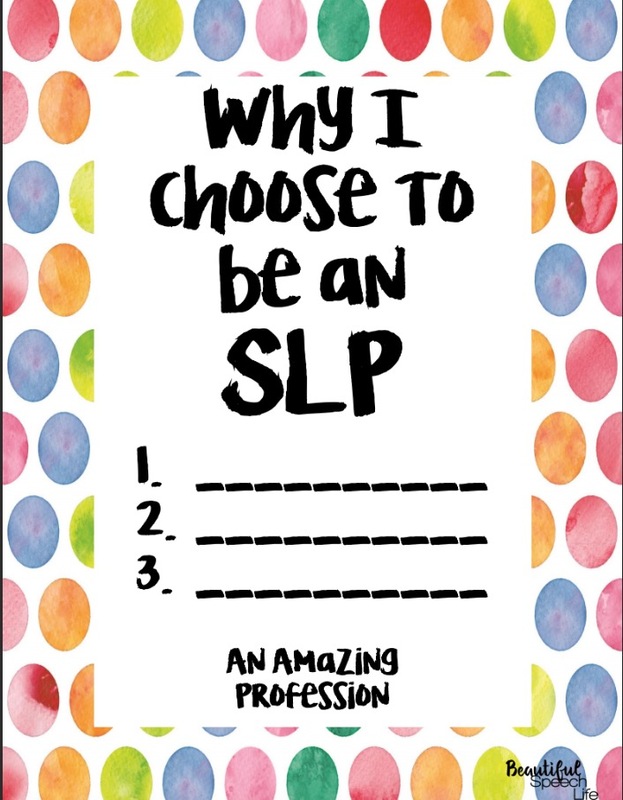 Think back to why you chose to be an SLP. Specifically a school based SLP. What are your top three reasons? Really think about it and dig deep. Don’t let yourself off the hook with “I don’t know”, this is important. Are the reasons still the same? What results do you want? You can do this, it doesn’t need to be perfect; you just need to be clear. Diversity. I love how diverse the profession is, with the continuous learning curve. Honestly, salary and vacation time does have something to do with it; I’m pretty happy with mine, considering the amount of time I have off. Creativity/Play. Helping my students learn through play and creativity is another aspect of the job that I really love. So here’s your “homework”… figure out your top three reasons for being an SLP. I’ve created a few fun worksheets for you to help get you started, just click on the image below. Stay tuned for next week, when you’ll figure out how to get more of what you want (from your 3 things list) and remove some of the obstacles. What’s SLP Like a Boss? An SLP boss is professional, compassionate, organized and Inspirational with a capital “I”. An SLP boss gets things done! In this series I’m interviewing SLP boss women who work by day as SLPs , but at night (and on weekends) they are business builders, advocates, huggers, tear-wipers, encouragers and creators. These are strong, amazing women that I admire and am happy to call Friend. Today our SLP Boss Lady is my friend Sara Wu. I met Sarah in Las Vegas last summer at the Teachers Pay Teachers (TPT) Seller’s Conference. (I met so many great people there.) We also share the blog Speech Spotlight, along with seven other fabulous speech language pathologists. Sarah is a powerhouse bilingual SLP. Not only is she bilingual (speaking fluent Spanish), but she has a Chinese last name (Wu), and is a dual citizen(she was born in Australia). Sarah is mother to two young boys and still finds the time to create bilingual therapy materials for her TPT store AND to blog weekly. I love her thought provoking, helpful and insightful blog posts. She writes “evergreen” content that you’ll want to bookmark and share with your friends. I’ll put a link to her blog and TPT store at the end of this post for you. I write this series because I feel we can all make our practice as SLPs better and stronger by connecting with other SLPs. It’s also really interesting to see what other SLPs are using in therapy and what advice they have to share. So let’s dive in and see what we can learn about Sarah. Tell me about yourself in seven words: Joyful, fun, silly, smart, mischievious, mother, and writer. Where did you go to grad school? : Northwestern University. What are your top three SLP must haves (other than your own amazing materials)? : My clipboard, my laptop, and big foam dice. What do you love most about what you do? : Helping my students reach their potential. I think the students I work with have so much potential that’s hard to see. So many of them speak Spanish only and they’re learning English. I work with them exclusively in Spanish until they are ready to move on to English. 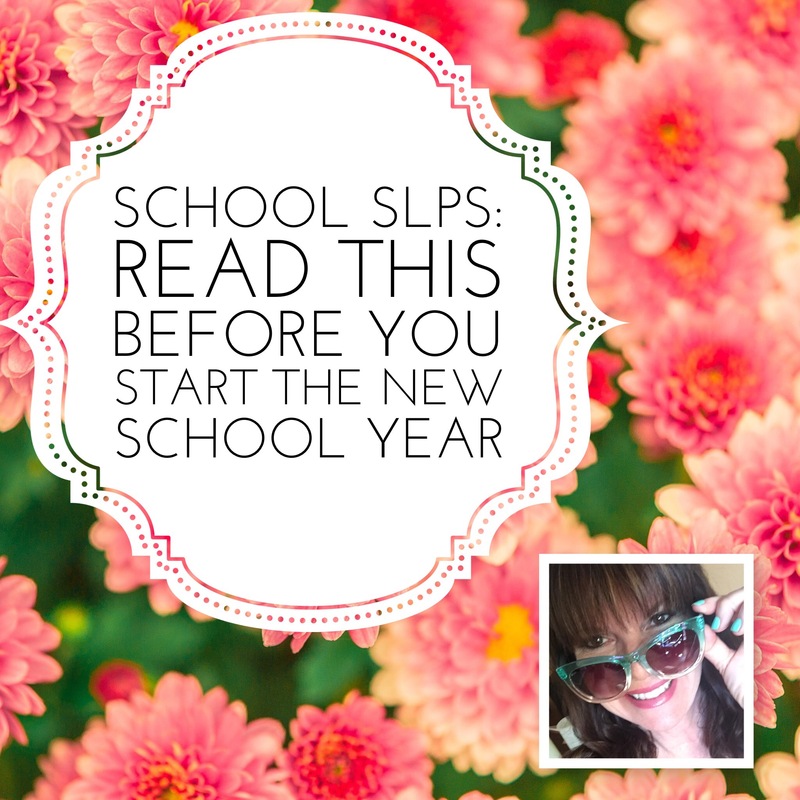 Tell me your advice for the newly minted SLP: It’s important to take risks. I don’t think it’s something women are encouraged to do. Don’t just take the safe path, not just the easiest or the closest. Don’t settle. Do what you have to do to go for it. I’ve always made sure I feel one hundred percent about where I work. If you don’t, it’s worth it to take a leap. Tell me about your blog: I like to make sure that it’s useful and important to SLPs. I blog about being bi-lingual. I talk about topics instead of products. Tell me about your TPT store: I’m creating the Spanish products I can’t find anywhere else. Sometimes I don’t care for the word choices of commercially produced items. It’s not just Spanish, I have English products too, and bilingual. They’re so much fun to create. What SLP-boss inspires you? Natalie Snyders. Her products are very evidence based and well researched. And she has the gift of connecting other SLPs through facebook. My hat is off to her. So now you know a little more about one of our fellow SLPeeps and SLP Like a Boss Sara Wu. I hope you feel inspired and connected, I know I do. Who inspires you to SLP Like a Boss? Would you like to suggest an SLP for me to interview? Let me know in the comments OR email me at beautifulspeechlife@gmail.com. 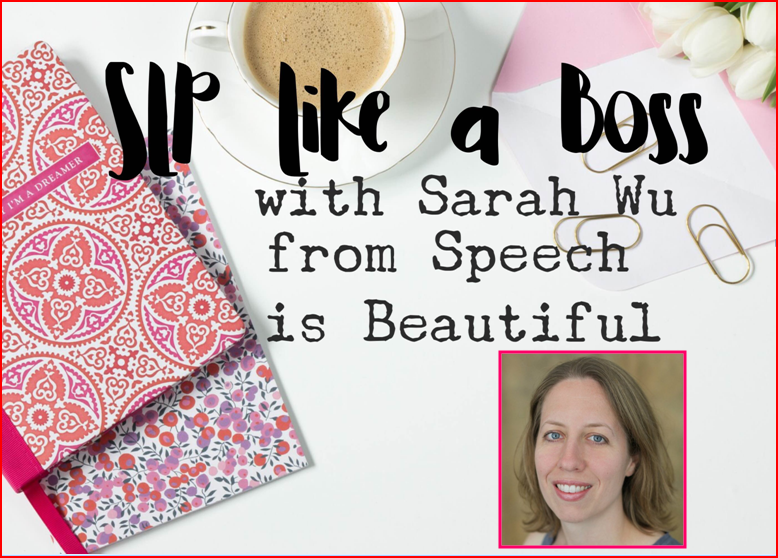 To learn more about Sarah and her store: Speech is Beautiful Blog and Speech is Beautiful TPT. She and I both blog for Speech Spotlight. Read other SLP Like a Boss interviews: Felice Clark, the Dabbling Speechie, Kim Lewis from Activity Tailor . So I have a confession to make…my Better Hearing and Speech Month poster and handout never got posted or handed out at my school this year. Here’s what I pictured. Laminated poster in the staff room, copy in all staff mailboxes with a cute saying and some candy. Then, everyone says, “wow, thanks Anne. That was really informative.” I post a nice pic of it on Instagram and feel like SuperSLP. Here’s what really happened. I hit print for my handout and then walked to the staff room where the color printer is located (which is two buildings away) to get my copies. Got error message that printer needed toner cartridge. I checked with school secretary and she told me toner would arrive the next day. I tried again the next day and my passcode no longer worked. I retried and walked to the staff room two more times. Meanwhile, I had all my year-end things to do. Please note that our year end is May 22. The teachers are busy, tired and frazzled. I am busy, tired and frazzled. I know they are not going to ready my handout now. (There’s something to be said for timing). So….I made an executive decision. I told myself ( for the one billionth time) that I don’t need to be perfect. I thought about my teacher friends and what they needed at this time of year. I grabbed a few dozen Bosa Donuts ( soooo delicious) on my way to work last Friday, made a cute sign promoting Better Hearing and Speech Month, put them in the staff room and called it a day. Once again, “done is better than perfect”. Of course, I still want to give them the handout because it’s good stuff (that can be really helpful). But, I can do that in August when we’re all refreshed and ready to go. I’ll just rename the handout then. For your very own copy of my Better Speech and Hearing month poster/handout click here. I know many of you are winding down for the end of the year. It can be a crazy demanding time. Remember you don’t have to do it perfectly. Congratulations on your graduation-you made it! I know it wasn’t easy. But you did it. You are the proud owner of a masters degree in speech language pathology. Make sure you get a beautiful frame for your diploma-show it the respect it deserves. Celebrate and take a little time to relax. No more tests, finals or studying for the Praxis. No more research papers, at least not for a while. You are starting an amazing journey. I’m sure you’ve had a taste of it through clinics and internships. Clinical fellowship is next. A time to jump in with both feet with a mentor who will have your back. This job will delight you and at times exhaust you, but should never bore you. You are now life changer. You will connect with parents during times of doubt and vulnerability. You will teach them ways they can help their child. You will laugh with them and most probably you will cry with them. You’ll have some great triumphs. Like the first time a previously nonverbal child speaks. You’ll have some epic disappointments. Because you care, you’ll feel the highs and the lows and all the emotions in between. And you wouldn’t have it any other way. You will try all kinds of therapy methods and you’ll keep trying until you find something that works. You’ll get hugs and high-fives every day. You may be the one person that is a constant source of love for a neglected child. Your heart will be broken. I’m sorry but it will. Maybe by a story a child tells you about his home life or by having your favorite child move without saying goodbye. Or even worse, by having a student die. But you will keep coming back. You’ll work with so many amazing teachers who inspire you and a few negative teachers who will draw you into their disappointment if you let them. Protect yourself from The Negative Ones. You will have scheduling challenges and conflicts. At times you’ll be overwhelmed with progress reports and IEP’s. But you’ll figure it out. Even though you learned so much in grad school, you’ll wonder about all the practical things they didn’t teach you. Remember, you don’t have to do it alone; you’ll find other SLP’s to support you and who’ll share their ideas. As the years go by, you will shape lives. Yes, you. You are helping children to communicate. You are giving them a voice for their thoughts. And sometimes you are giving them the building blocks to create new thoughts. You are helping them have rich conversations with friends and giving them strategies that they will carry with them for the rest of their lives. It is with honor, laughter, knowledge and kindness that you will guide your students to experience success. You will love it. Welcome. The world needs you my friend, wishing you all the success you deserve. P.S. Have you heard? 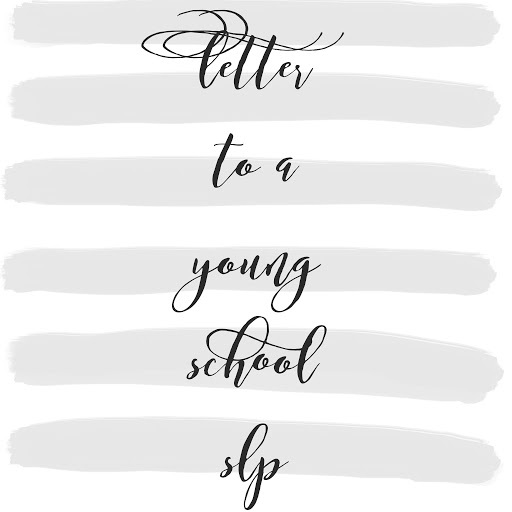 We are having a huge SLP2Bgradgift giveaway and there’s still time to enter. Click here to find out all the amazing details. The prize is worth over $500. Hurry! Giveaway ends on Friday, April 22. How do you SLP like a boss? Someone who SLPs like a boss, is professional, compassionate, organized and inspirational. An SLP boss gets things done! 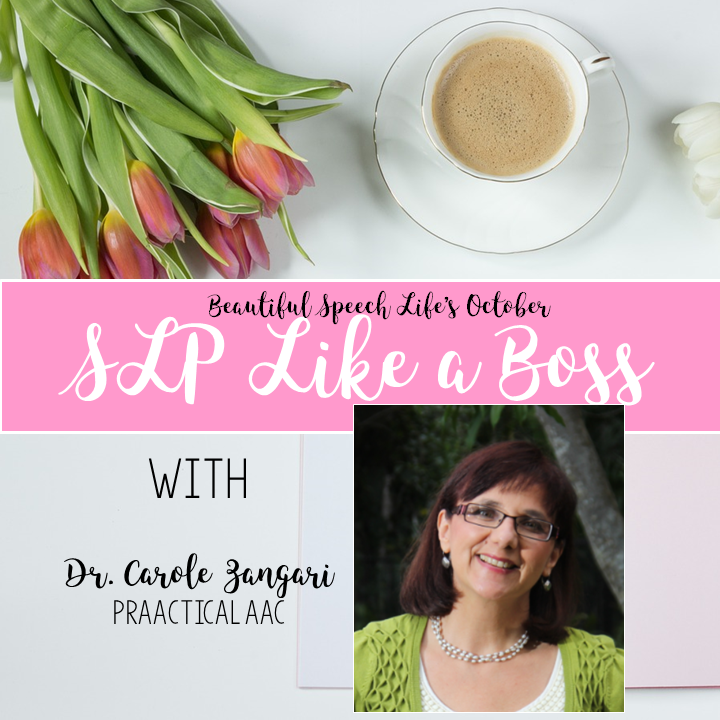 In this series I’m interviewing SLP boss women who work by day as speech language pathologists, but at night (and on weekends), they are business builders. I’m talking about running websites, writing blogs and creating therapy materials for their fellow SLPs and teachers. They not only serve as advocates for their clients (students); they are advocates for our profession. These are the strong, amazing women that I admire and who inspire others. 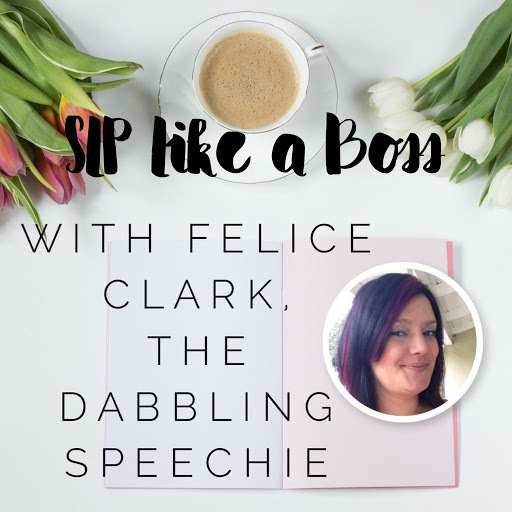 Today I am talking with SLP Boss-lady Felice Clark from the creative website The Dabbling Speechie. You know when you meet someone for the first time and you like them right away? That’s how I felt about Felice. Friendly, funny and smart; she personifies SLP Like A Boss. I met her last year in Las Vegas at the Teachers Pay Teachers Sellers conference and saw her again briefly at the ASHA convention in Denver. Her TPT store features over 165 products. My current favorite is “Help! I Need Social Skills Pack”. Felice is currently working as a school speech language pathologist. Let’s dive in. What do you love most about what you do? : I love planning engaging therapy. I feel like I hit a home run when one of my lessons really helped a student make progress toward one of their goals. Tell me your advice for the newly minted SLP: Set healthy boundaries for yourself. It’s okay to say “no” to something that you can’t accomplish or finish in a timely manner. It will help you with managing your caseload and ultimately keep your stress down. When I over commit myself, I usually am more grumpy with my colleagues and speech students. If you are taking work home more than 3 days a week, you either don’t have an adequate workload or you aren’t setting limits with your work life. Tell me about your blog: My website is for busy SLP’s that have limited time to plan and find resources for their students. I find and/or create engaging therapy ideas for those SLP’s that desire to keep a “sparkle” in their speech room. 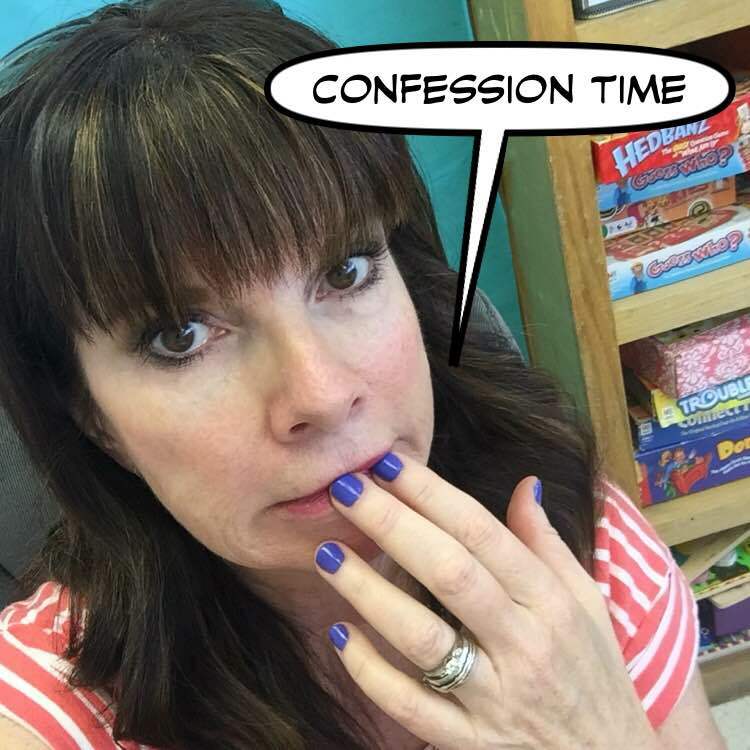 Tell me about your TPT store: My store has lots of goodies in it! I have a wide variety of resources, but I would say my most popular resources are my social skills packs, grammar sets, no prep activities and my big time saver AAC starter kit for students who are non-verbal or limited verbal. For spring, you need to grab my Nature Walk FREE printable for some outside therapy fun! What SLP-boss inspires you? That’s hard, there are so many. I always like Nicole Allison’s items and the way she approaches therapy. I admire that she is methodical and the way she takes data. And Natalie Snyder is also very knowledgeable in this area. What is your favorite children’s book? At the moment, one of my favorite books of all time is Cloudy With A Chance Of Meatballs. What about picture books? I love using books in therapy! Some of my favorites for spring are In The Tall, Tall Grass, A Tiny Seed, The Gardener and The Hungry Little Caterpillar. I really enjoyed catching up with Felice. There’s always something magical about talking to other SLPs, it’s like we’re all a secret society of smart women. To learn more about Felice, check out her website The Dabbling Speechie. And in case you missed it, here is the article about Kim Lewis, another SLP Like a Boss. Did you like this post? If you did sign up for my email list, so you never miss another post. How do you SLP Like a Boss?